We have updated the sample of DHTMLX Scheduler .NET with recurring events and live update enabled with SignalR in ASP.NET Web Forms C#. It can be downloaded from this page below or found on the download page where you can also get other useful samples (including sample with SignalR in MVC). 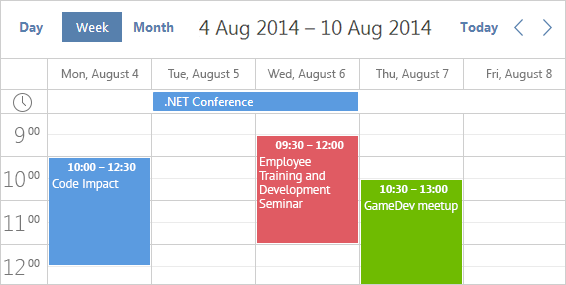 This is a simplistic calendar application created in Web Forms using DHTMLX Scheduler .NET. We used the SignalR library to enable live update in the calendar and allow calendar users to see any changes instantly. Get DHTMLX Scheduler .NET with SignalR in Web Forms right now.